Every so often, advances in modern dental medicine result in huge leaps forward for the treatment of certain conditions. Not since 20 years ago, when adhesive dentistry was first introduced, has a more innovative dental procedure become available. Dr. Sasson is very excited to incorporate laser dentistry into his practice. 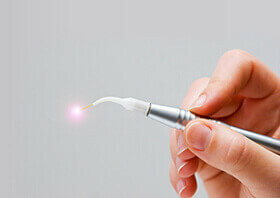 The FDA-approved Waterlase Dental Laser by Biolase has revolutionized our periodontal-care program. Boston Smile Center & Implant Dentistry is one of only a small group of Boston-area dental offices using this highly sophisticated new laser. With the aid of lasers, Dr. Sasson can perform periodontal procedures with extreme precision, greater comfort, and patients often recover faster than with traditional methods. A majority of U.S. adults will struggle with gum disease at some point, and many of those who do may come close to losing teeth as a result. Why is this? Because a very small percentage of those with advanced gum disease (known as periodontitis) seek the appropriate treatment—perhaps because the idea of advanced care makes them nervous. And who can blame them? Thankfully, there’s now an alternative to traditional periodontal therapy with a scalpel and stitches. With laser dentistry, Dr. Sasson can provide his patients from Brookline and Newton with a no-cut, no-sew treatment solution. This solution also comes with fewer offices visits and a shorter recovery period. You can actually return to your normal activities immediately following your visit.